In a report issued by the Swiss Reinsurance Company (cover and link below), an integrated view of the risks posed to cities around the world was offered. The report notes that "...the growing concentration of people, assets and infrastructure also means that the loss potential in urban areas is high and rising." 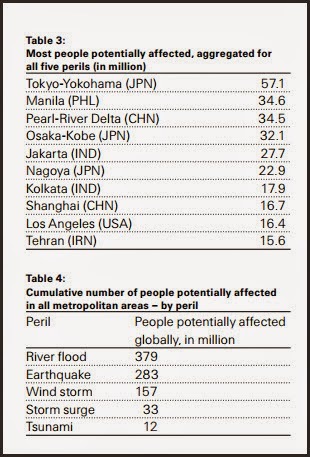 The report summary also notes that "...physical prevention measures alone do not suffice to build a resilient city, since damage from the most severe catastrophes cannot be fully averted. 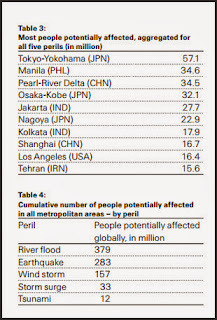 An important part of resilience is how well urban societies are able to cope with financial consequences of a disaster..."
One Tables 3 and 4 of the report (below) are a summary of their findings relative to the top 10 global cities affected by the five perils of river flood, earthquake, wind storm, storm surge and tsunami. 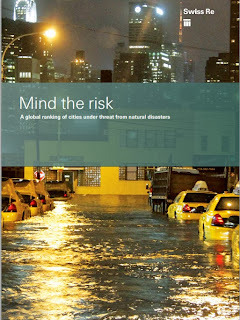 With the continued conversation about climate change affecting sea levels and the comments noted above regarding storm surge it appears that flooding catastrophes are risks cities need to plan and prepare for. 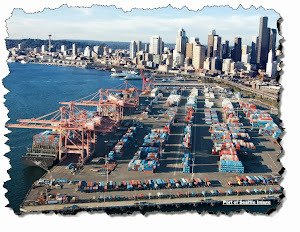 Investments in infrastructure would also help cities cope better with natural disasters and other shocks such as human pandemics and acts of terrorism. Anyway, as an "infrastructure geek" I found this review interesting and consistent with the other lessons learned from Super Storm Sandy, the 2011 Tohoku earthquake in Japan and the recent typhoon in the Philippines.